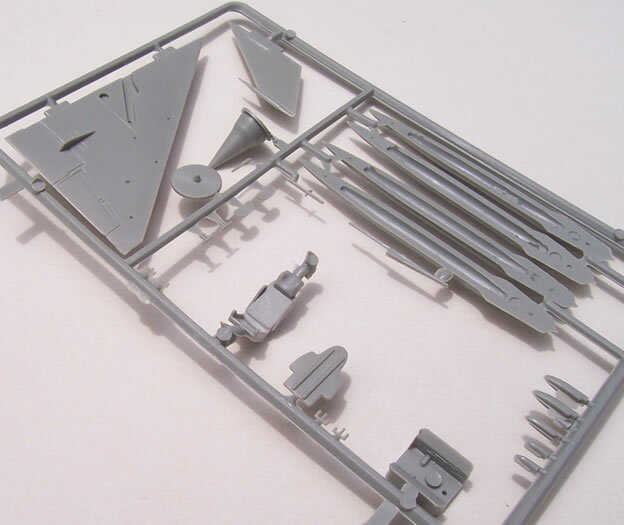 59 x grey styrene airframe parts, 2 x clear styrene parts, decals for one or five subjects (depending on how you look at it). A good old kit that has held up well over time, and is quite a bit cheaper than its more modern, albeit superior rivals. Although raised, it has very fine surface detail. Much better quality decals and clear parts compared to some earlier issues of this kit. 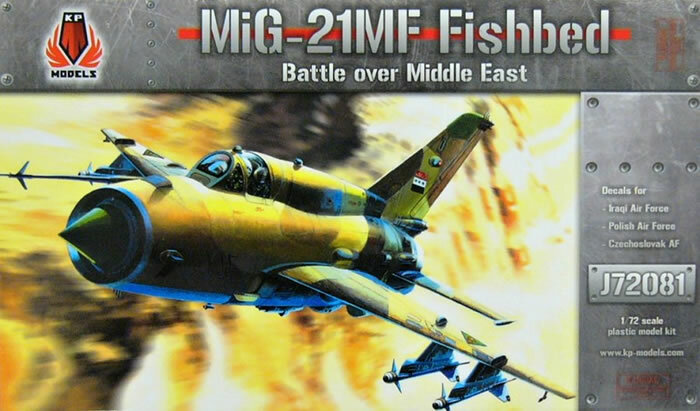 The rather nice decals provide five options, only one of which is covered by the instructions, and this is the only option which has any connection to the Middle East title. Some extra building care will be needed to get the best out of this kit given its age and raised detail. 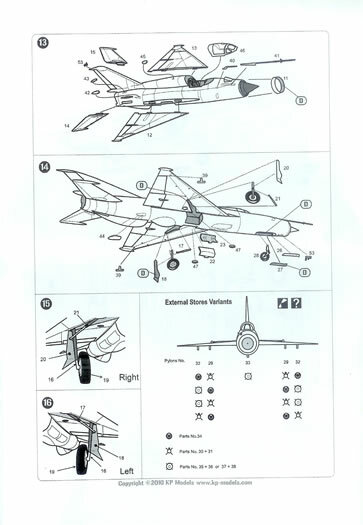 If you need one or several a MiG-21MF’s, and you’re on a budget, this is probably the kit for you. Generally accurate and with fine surface detail a good result can be achieved. Otherwise spend more than double on more recent and easier to build kits from other brands. KP Models would do well to relate their instructions, decals and box-art more conscientiously than they have done with this issue. 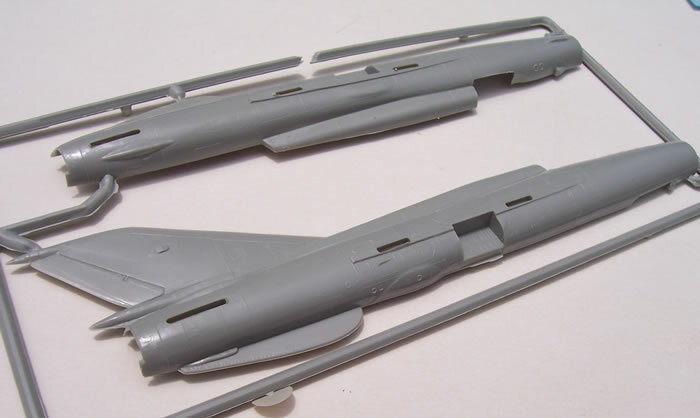 There have been numerous kits of the MiG-21 in 1/72 scale from both main-stream and some lesser-known kit makers. Many are best forgotten, although fortunately there have been some good if not perfect releases. Revell’s first generation and Zvezda’s second generation Fishbeds spring to mind as good well-priced kits that have been released in the last few years. Prior to this Fujimi had a series of second generation versions that were very nicely produced, albeit with some minor accuracy issues. In some markets they were hard to find and could be pricey. Probably the first acceptably accurate, and for a long time the best second generation MiG-21 was by KP, a Czechoslovakian and now Czech company. Initially produced during the days of communism, it could be hard to obtain and featured poor quality packaging, atrocious decals and indifferent clear parts. The moulds are still in use, and this kit is the subject of this “first look”, although in some ways it’s more of a walk down memory lane. Supplied in a glossy top-opening box with nice artwork, the box top advises this is a “Battle over Middle East” issue, but more on this later. The parts come sealed in a cellophane bag, and there’s not much wasted space inside the box (something I like, not because I’m being green and PC; it just reminds me of how kits were in the 1960s). The instructions are a giant leap forward from their original Marxist-Leninist version. Good quality paper, a parts map and clear diagrammatic assembly guides are more than adequate. Painting and decaling guides are fairly small black and white shaded diagrams, but are adequate enough (although again, more on these later). Detail and airframe painting is keyed to Humbrol and Agama paint codes, along with a generic paint name. The moulds seem to have held up fairly well over the years, with little flash and most detail still crisp. For its time the ejector seat was probably better than those found in most kits of the same scale and vintage, but with such a small canopy not a lot will be seen. Surface detail consists of very fine raise lines. It is still some the finest raised detail I have seen, and has the potential to look more in scale than most recessed panel lines which are in fact wider; it’s that good. If there are a couple of moulding weaknesses it must be with the rather indifferent main undercarriage legs in particular, and the nose leg to a lesser extent. These are very simple and bland affairs, but not a lot will be seen once the wheels and undercarriage doors are fitted. There are also separate engine cooling scoops that will benefit from hollowing out a little before fixing to the rear fuselage. A choice of under-wing stores is provided, consisting of drop-tanks, missiles and rocket pods. There appears also to be a choice of pylon for the last two, but the instructions do not at first appear explain the basis of the choice. However there is a stores location diagram that indicates pylon locations on the wing and which stores can go on which pylon. Since this shows any store can go on any pylon it may have been easier to show where the pylons go first in the instructions. The canopy is much clearer and brighter than older issues, although there is some optical distortion. The decals are another revelation. The original communist KP decals were just plain rubbish. I have experienced improved decals with KP kits when re-boxed by Mastercraft/Kopro of Poland. 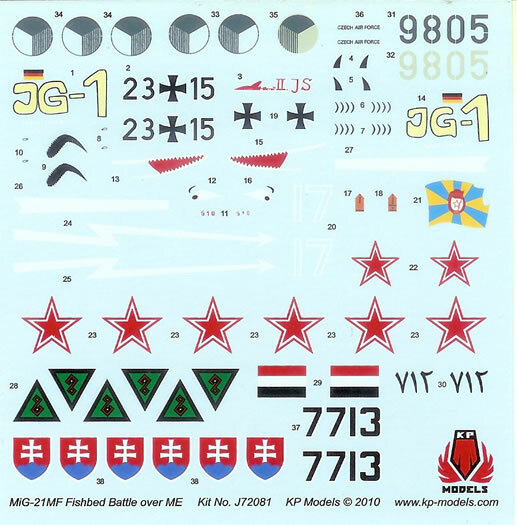 These kit’s decals looked fairly reasonable but sometime still had registration issues. However the decals supplied with this kit are another step up, with excellent registration, crisp printing and what looks to be good colour density. Now back to the “Battle over the Middle East”. The fine print on the box top says Iraqi, Polish and Czechoslovak air forces. Of the three paint schemes covered by the instructions, one is for Iraq, so we're okay there, but the other two, Czechoslovakia and Poland, have very little to do with the Middle East! Then if we look at the decal sheet we see that that it offers modern low-visibility Czech, rather than Czechoslovakian roundels (nor are the codes that the instructions show for the Czechoslovakian machine supplied), no Polish square insignia are supplied either! There are however some German crosses, Russian stars and Slovakian shield insignia. So, of the five nationalities offered by the decal sheet, only the Iraqi scheme corresponds with the instructions. I thought that maybe the wrong decal sheet had been supplied but no, the kit number on the decal sheet corresponds with that printed on the box and instructions. How many will buy this kit assuming a selection of Arab air force markings will be offered, rather than just one? This is a kit that was a leader in its day, from moulds that have generally stood the test of time. A modern kit it is not, but I think that a very good result could still be achieved. 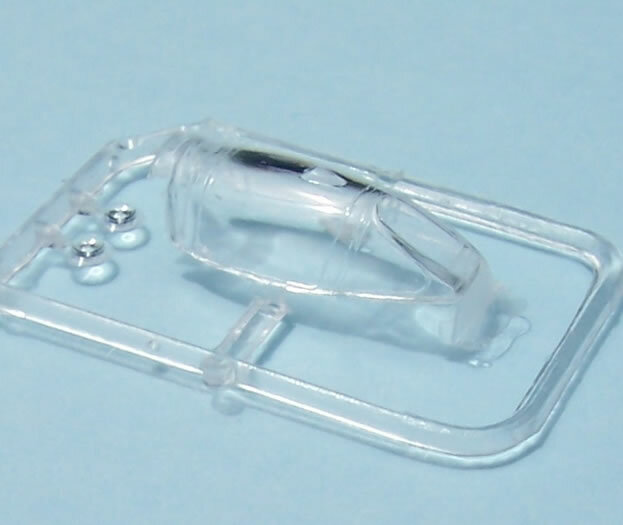 There are numerous after-market accessories designed for this kit with PE detail sets, vac-form canopies and resin cockpits all readily available. 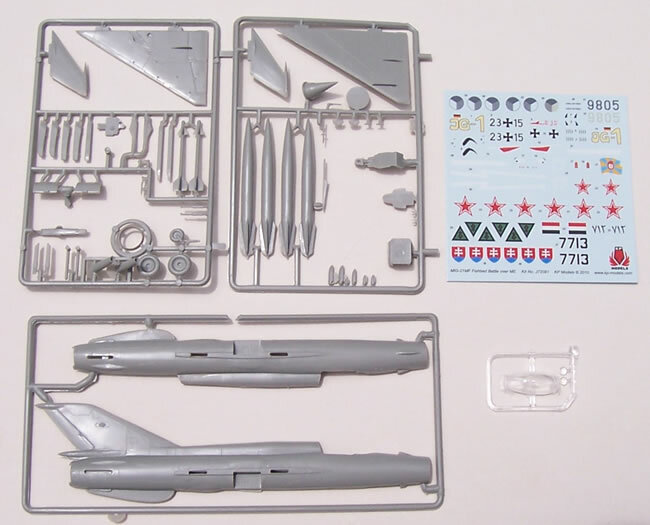 However, given that there are other more modern kits of the MiG-21MF available, I think that this KP kit’s value does not lie with being the basis of a super-detailed masterpiece. Instead I think it may appeal to those who want a simple low-priced kit, or maybe wish to do several portrayals of the many colour schemes applicable to this subject. This latest iteration of what for its time was a very good kit is a real improvement in terms of packaging, decals and clear parts. It should still build into an attractive enough model, and costing 60% less than the Zvezda kit it will appeal to some. 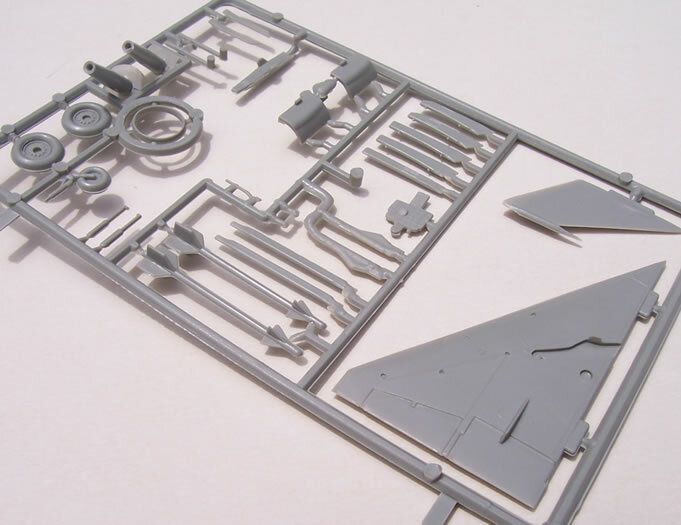 Personally if I was just building one or two I’d go the Zvezda or Fujimi route, but this said I feel I can still recommend this kit with confidence to the budget-conscious. KP-Models really need to make sure that they instructions, decals and box-art titles – Modellers don’t want their kits to be like Forest Gump’s chocolates. Thanks to Lucky Model for the sample.